I don’t mean to make a habit of this, but someone e-mailed me asking for support of their entry into the Spreadshirt Derby, and I just can’t say no to people. So take a look at the naked running man (gonna click now aren’t cha!) and rate it how you judge. I’m never too sure about running stores that have ‘funny’ tees, since I know lots of people don’t buy into the whole Busted Tees vibe, I always wonder whether a tee which is a joke has much longevity socially, compared to a nicely designed artistic tee. But Bedlam Clothing does seem to have a little something to it. As well as making you laugh, they also have a focus on what seems to be the worlds favourite past time, gambling (if the shows on late-night tv are anything to go by). I’ll let the stores’ owner, Michael, fill you in on the details. All of our original designs are printed on American Apparel clothing and are of the finest quality. Now I will be the first to tell you that I donâ€™t have much of a graphic design background, I think and design in terms of text, so thatâ€™s what youâ€™ll find on a majority of our current designs. The next round of bedlam tees will be done by established artists and will move in a more graphic-based direction. To make room for the new stuff Iâ€™ve placed every bedlam tee on sale for $10 until inventory runs out. Nice to see a bit of humility there from Michael, and whilst he says he thinks in terms of text, at least he’s picked some great fonts! So pick up a bargain or two, since you can’t really go wrong with American Apparel stock for $10. I quite like letting the companies do the describing for me sometimes, and not just because I’m lazy, I’m just not as good at talking like a PR guy as designers are. Observe. 302designs, established in December 2004, is run and managed by four unique individuals. Each partner brings their own differentiated interests, skills, and backgrounds to the company. Each design is a symbolic representation of an individualâ€™s feelings. Some of the recurring themes are emphasizing the importance of listening to one’s own internal passion, promoting individuality, and maintaining strength from within. 302 considers itself a socially conscious establishment. Keeping with this theme, we refuse to contribute to sweatshop conditions of any type. Each shirt is printed on material from American Apparel, out of L.A. They support fair wages and benefits for all their employees. But I guess that since 302designs describes itself as a company that creates ‘poetic t-shirts’, you’re going to get descriptive language, and this theme runs through into their t-shirt designs. All the tees marry life-affirming and inspiring text with intricate and detailed graphics. It’s one of the strongest line-ups of inventory that I’ve seen for quite a while, if I were to choose one I’d really struggle, I only picked the one in the picture (Imagination) because I prefer brighter colours in the summer. There is also a full girls section, including one or two designs that aren’t available for the guys. All the items seem well priced, running between $20-$27, and considering how great I think these tees look, well worth the price. Bit of a departure from our usual sleeve-based adventures, but I figured that you might be interested in seeing what Cool Hunting thought were the twelve best bags for men out there. I can’t see anything in there that would accommodate my laptop though, why did I have to go for a 17″ monitor? It really cuts down your options for a nice bag or sleeve. If anyone has any tips drop me an e-mail or leave a comment. The sun is still beating down here, so I’ve decided on having a tee week (as if the past 2 days hadn’t made that clear).Mochi1045 feels more like an artist who happens to print some designs onto tees rather than someone who owns a tee shop, but it doesn’t exactly take a genius to work that out, there’s a 50/50 split between tees and canvases in the shop. 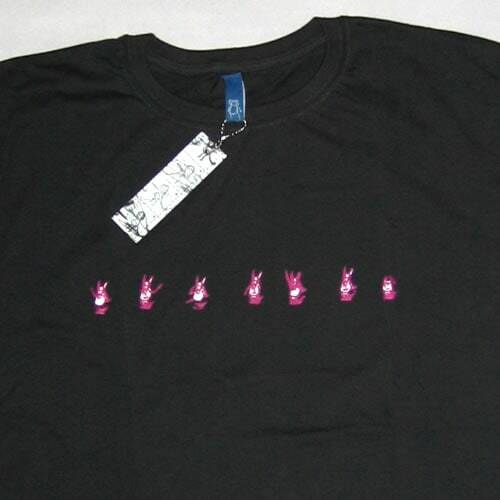 All the designs loom pretty small on the tees, and the detail on the pics isn’t what I would hope for, but they still look pretty promising, and the idea of pink dancing wolves is still cool, so they’re probably worth further investigation from the HYA readership. It is high time a sense of realism came about to give martial arts a better standing in the market. Skaters, hip-hop sports wear, football and rugby all have their urban following, but martial arts has yet to be represented. A lot of our designs are based on martial arts and oriental themes with a view at more authenticity and perhaps education. A lot of people don’t even know that the words “Kung-Fu” actually means “hard work” (because it takes a lot of hard-work to become a master). We aim to produce the best martial arts orientated teeshirts around. Since there aren’t many out that we liked, it made sense to make our own to wear. There are currently six different designs on sale, and whilst they’re only available in a medium size at the moment, Weng from Shaolinen e-mailed me to say that they hope to offer a wider range of sizes soon. They seem to be having a bit of a sale at the moment, with tees costing Â£15 (UK) and Â£23 (overseas), with delivery included. Their flash site is really slick, although there is also a HTML version for those of you on dial-up, or just with Flash-phobia. Too hot for hoodies, am I right, folks? Go Ape Shirts sprang to the attention of the ‘sphere a few months ago when Dave Horowitz’s infamous Boo Boo Walker design struck a chord with Star Wars loving hipsters. Amazingly, Go Ape hasn’t been sued for copyright infringement by George Lucas and are back with their second series of shirts, complimenting the first series, which are still on sale (well, you wouldn’t stop printing a bestseller now, would you?). The two new shirts are both nice (click on the thumbnail to see them in greater detail), with ‘Elliots’ New Friend’ being a great mashup of 80s pop-culture, but I wouldn’t want to make it seem as if Go Ape is only strong when it’s referencing movies, company owner Josh has brought together an impressive collection of artists, and he seems to be being very selective about what he’s selling. The website is still fairly idiosyncratic at the moment, being kind of a blog/store hybrid, though there are some very nice implementations of Flash that it would be nice to see extending throughout the site. Josh has also said that he might order some hoodies when it starts to get a bit cooler (Go Ape is in Arizona though, so you may be waiting some time! ), so keep an eye out for them in the future. All shirts are screen printed on American Apparel and are a reasonable $18 + shipping and handling. Something for the ladies, its been a while since I gave you a treat! I did the whole skull and crossbones motif, especially since it isn’t done in a stereotyped and done-before white pirate style (not that I’m averse to looking like a pirate). The pic isn’t that clear, but it sure does look nice, I’d imagine that it is bits of material, rather than screenprinted, or maybe thats just what I’d hope it was. La Fraise + Spreadshirt: Interesting noises coming from HipHipUK (new UK based tee blog) that the popular French submission-competition tee company La Fraise has been bought out by Spreadshirt. I can’t find any corroboration on this at the moment, but it’s an interesting move on the part of Spreadshirt since they already have a design competition running in the form of Derbz. Yabbos: May I predict that these guys will receive a level of Oddica-esque love from bloggers for the next month or so? 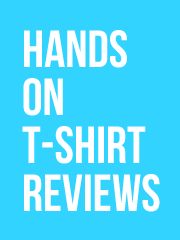 They’ve got some good designs (sometimes in the Threadless style), and more importantly, they’ve got a name that you like to say, and will remember. I’m not too hot for their site design and layout though (aren’t they using the same font as That 70s Show?). Chateauroux: As mentioned in this weeks gossiptastic mailout of Popbitch, so they don’t exactly need my promotion, but they do have some hot tees, even though they’re a bit pricey for my tastes. Rokko: Limited to a maximum of 15 pieces per design, so exclusive that if you ever see someone else wearing one you’ll do a double-take so fast you may well break your neck. With all the amazing weather I’ve been enjoying I almost forgot to post… sozzle, but at least I have a great hoodie to make up for my forgetfullness. The idea of putting a life-size skeleton onto a piece of clothing is hardly original, I even saw Pete Wentz (the SFOB that gets me lots of google traffic) wearing a skeleton tee on the front of a UK magazine called Rock Sound, but I’ve got to pay waffo their dues and applaud the quality of design in their release. 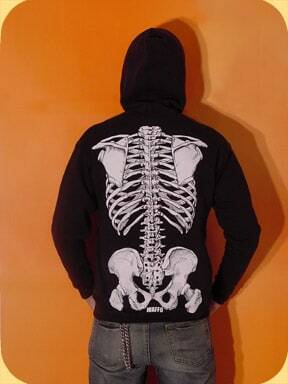 Unlike most offerings, this hoodie has the skeleton from both a front a rear view, admittedly no one is going to think you’re an actual skeleton, but it looks pretty sweet nonetheless. If it’s good enough for Cool Hunting, it’s good enough for me. Bam Clothing don’t seem to be too into logos or prints at the moment (the furthest they go is some rather typical preppy-frat-boy typography that proclaims ‘BAMBOO’), but you can’t deny quality, whether it has pretty pictures or not. 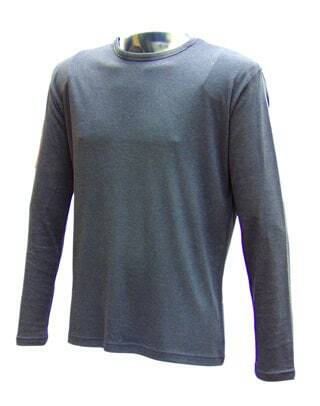 The most amazing thing to me is – if I’m reading this right – that the inherent properties of Bamboo mean the shirt is antibacterial, does that mean that this long sleeve tee actually has the ability to clean you!!?! ?OMGZZZ Sure does sound like the future to me. 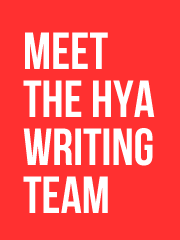 I totally forgot to mention the new sponsors here at HYA, Enclothe, who I’ve been a big fan of for a while (and have a few new designs out at the moment), and Spitefuls who I hadn’t heard of before they contacted me, but am proud to have them on the sidebar. I was sure I’d already run this hoodie, but I guess not. 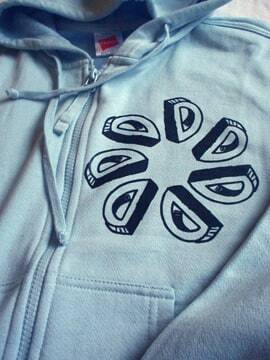 It may well be a logo hoodie, or at least Dadawan logo inspired, since its just the D repeated several times and happens to look like a flower. The light-blue is summery enough for you to get away with it when the sun goes down, but will be able to brighten up your day when we start to hit the colder months. 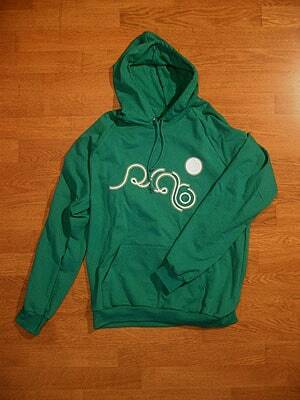 This hoodie is for the ladies, but there is a track jacket version in the same colour for guys. You can find it here. I can’t decide what stock they’re printed on, but by looking at the tag I would guess that it was Hanes. 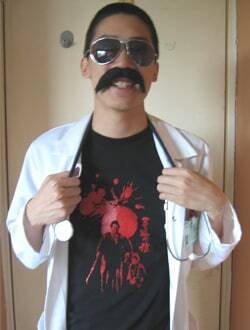 Doctor, we need an… Antidote! 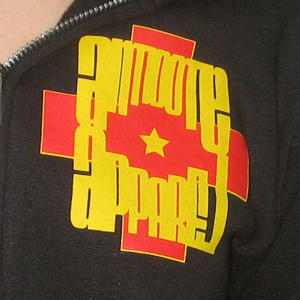 I’m not mad-crazy about this hoodie, but I’ve wanted to write about Antidote Apparel and their ethos for quite a while. Antidote Apparel is founded on the idea that clothes don’t necessarily have to depict violent or heart-breaking images and messages to be cool. Started by Greg from Punchline in May of 2005 the company’s mission is to provide clothes that reflect a happier side of you. As a vegetarian and drug-free owned company Antidote also makes clothing and accessories supporting these lifestyle choices. Aha, so that’s the positive counter culture then! The logo hoodie is pretty standard, it reminds me of the offerings that you get from the merch stand at a rock gig (I was pretty disappointed with the selection provided at last night’s Billy Talent gig I attended, amazing performance though). Though I guess I shouldn’t be surprised, since their webstore is supplied by Fueled By Ramen Records who I like to think of as the Drive-Thru Records of the mid-00s. 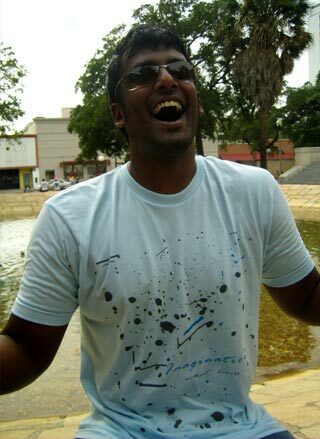 Check out their tees for some innovative designs, even their text tees are pretty cool. I know this isn’t a personal blog, I don’t want it to be and you don’t want it to be. Screw it. 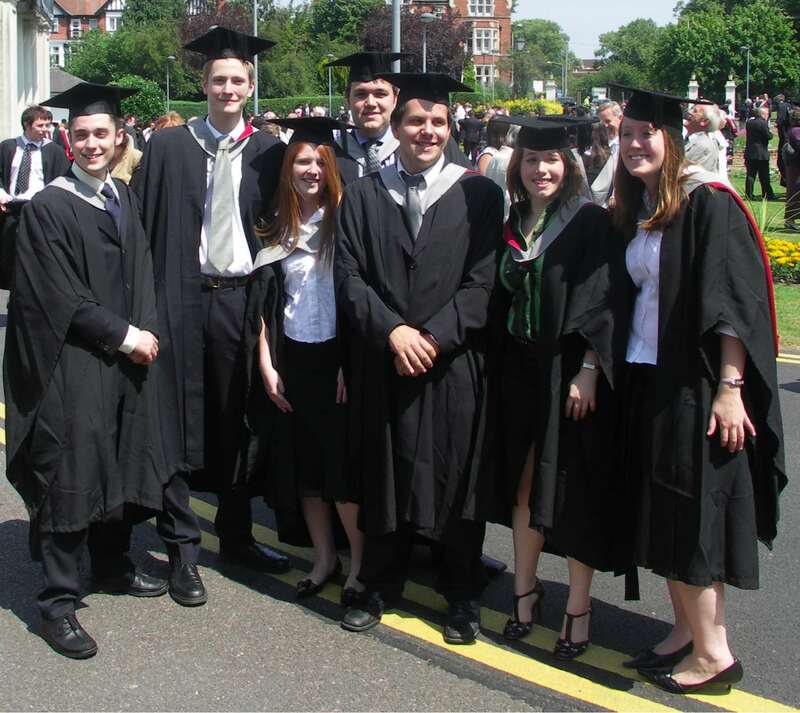 I graduated from university yesterday and just wanted to post a picture of me and my buddies looking stupid in our robes (which in fairness to blog context, do hide our arms, mostly). Oh, and this was the reason why I didn’t post yesterday, I’m sure you’ll forgive me. I’m middle-back, by the way. I usually wouldn’t talk about a tee-only company unless they’d sent me a tee (payola is alive and well at HYA), but I do have a social conscience as well, so when Christian from Alive Shirts e-mailed me to tell me about how Alive is trying to make sure those almost-extinct animals become a lot less almost-extinct, I was compelled to do my bit, after all, I’m not an ogre (raaaahhh, I’ll eat your bones!!! ), oh, guess I am. 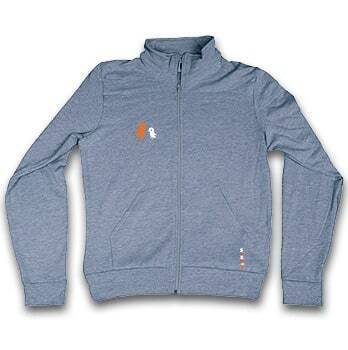 It’s all printed on American Apparel stock, and payment is handled by Paypal. I’m Karmalooping again, which always feels like I’m taking the easy option, but a good hoodie is a good hoodie, no matter who makes it (though I probably wouldn’t be promoting the HitlerCorp line of hoodies made by children that get paid in bit of broken glass). 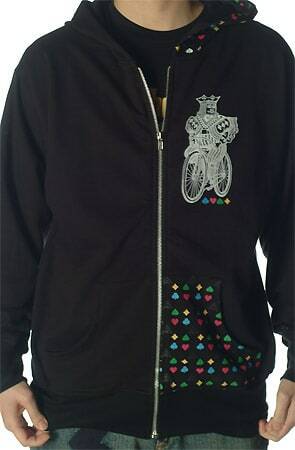 Gambling and poker related polo shirts and tees seem to be pretty popular on mainstream indie-chavs here in the UK, but I still think this is a cool looking hoodie, though I can’t quite work out why the King is riding a bike, maybe the people at Triko have some kind of crazy deck of bicycle themed cards. On the subject of the brand, according to this page Triko are non-sweatshop and try to use organic and natural materials wherever they can, so you can look good and feel good about wearing their clothes (just don’t get smug). Want money off? I signed up with the Karmaloop rep programme a while back and forgot to mention it, so you can get 20% off you order if you use my rep code, then 10% off every order after that, at least that’s how I think it works, shout at me if it isn’t. Karmloop Rep Link and my code is AS7594.